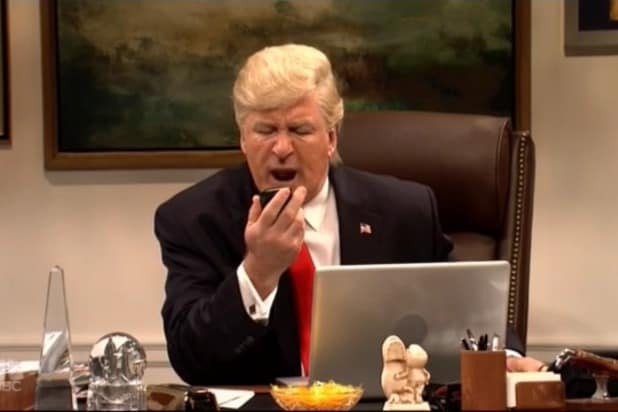 The discovery of a device that translates what dogs are saying into English on “SNL” revealed that host Scarlett Johansson’s dog was a closet Trump supporter, much to her horror. Johansson played a scientist named Helen, demonstrating the amazing discovery, but within moments of strapping a helmet on Max the dog that allowed humans to understand him, he proclaimed himself a bigtime Trump fan. “I like park, and leash, and I like Trump. He’s my man,” Max, voiced by Beck Bennett, proclaimed. “It must be a translation error, some kind of glitch,” Johansson tried to explain. Johansson wasn’t the only one horrified. Cecily Strong, playing one of the corporate masters holding the purse strings of the research project, was definitely not happy about Max’s political leanings. “Your dog is a monster,” Strong told Johansson. Johansson tried to explain to Max why Trump and his policies are bad, and how they might actually affect the dog’s life. “You just assume that because I’m a trump supporter that I’m a xenophobic racist,” Max accused.